Each time we visit the National Aviary we find something new. Last visit The spoonbills were hiding in their nest and the brown pelicans were flying around. This trip was a flip flop. The pelicans were hiding and the Roseate Spoonbills were flying around and squawking. The spoonbill is a beautiful but odd looking bird. 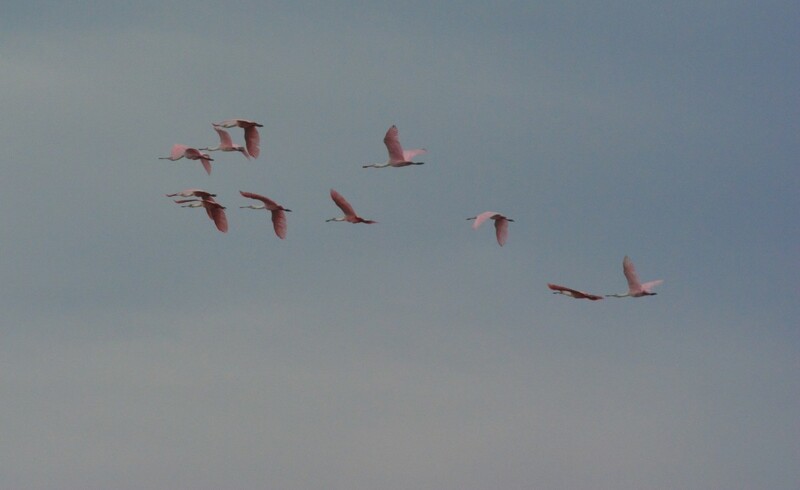 A lot of people visiting Florida think these birds are Flamingos when they see them in flight. Flamingos are not as common in Florida as many may think and are more native to South America and Central America. The spoonbill though is common in the southern United States. Mostly you will see them wading in wetlands but when they fly they truly look strange. These were photographed on Captiva Island in Florida. If you live where I live there are some birds you never get to see like Pelicans and Penguins. Another is the Roseate Spoonbill. They are found mostly in South America and in the USA can only be found in central and south Florida. They are large birds with wingspans up to 55 inches and don’t look like they should be able to fly at all. These were seen in the Ding Darling sanctuary on Captiva Island Florida.